How is climate change affecting the Commonwealth of the Northern Mariana Islands? 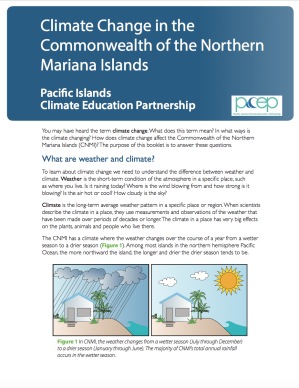 This booklet by Dr. Charles “Chip” Fletcher can help teachers and students understand the climate in the Commonwealth of the Northern Mariana Islands (CNMI), and why climate is changing locally and globally. It also explains the impacts of global climate change on CNMI’s ecosystems and communities. Information on other locations is available through other booklets in the Climate Change in the USAPI series.